Think of the word “utility” as a synonym for usefulness, and it’s easy to remember that the specific epithet utilis relates to the general quality of being useful – often for many different purposes. Pandorea utilis (common screwpine), for instance, has fruits that are edible when cooked, and its leaves have been used for weaving baskets, making ropes, and thatching roofs. There’s also Betula utilis (Himalayan birch): along with the many uses for its paper-like white bark, it also has medicinal properties. Here’s another easy association: from “domestic” as meaning “relating to the home,” it’s no leap to domesticus (and domestica and domesticum) as an indication that a plant has various uses around the home. Examples that have multiple uses in the kitchen include Malus domestica (apples) and Prunus domestica (plums). How about that staple of many warm-climate landscapes, Nandina domestica, commonly known as sacred or heavenly bamboo? According to Tropical Shrubs, it’s planted around the home for good luck; it’s used indoors to mark special occasions; and it’s sometimes also used to make chopsticks. Some names refer to very specific uses, which may not be all that practical these days but are still interesting. For soap-making, look for saponaria, as in Sapindus saponaria (soapberry), and of course the genus Saponaria (the soapworts). 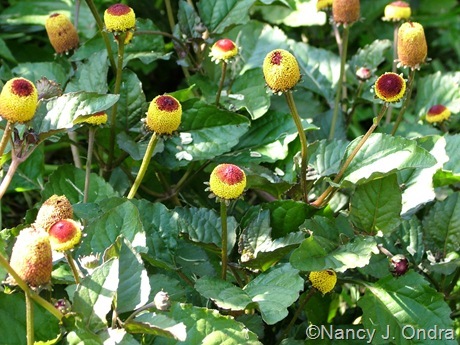 When you see tinctorius (or tintoria or tinctorium) in a name, you know that the plant has been used as a dye. Anthemis tinctorius (golden marguerite), for example, typically makes yellows; Coreopsis tinctoria (dyer’s coreopsis) usually produces reds to oranges; and Baptisia tinctoria (false indigo) produces blues. Need to raise the nap on some woolen cloth? 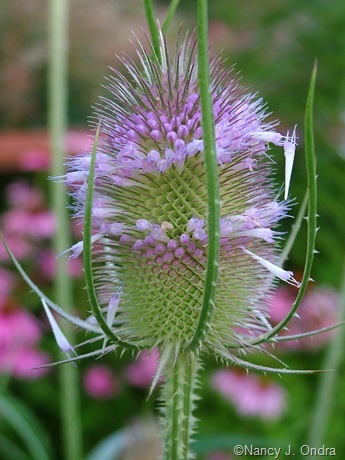 Look for fullonum, as in Dipsacus fullonum (fuller’s teasel). If you’re feeling crafty, look for plants with coronarius (-a, -um) in their name; that often means that they’ve been used for making wreaths or garlands. 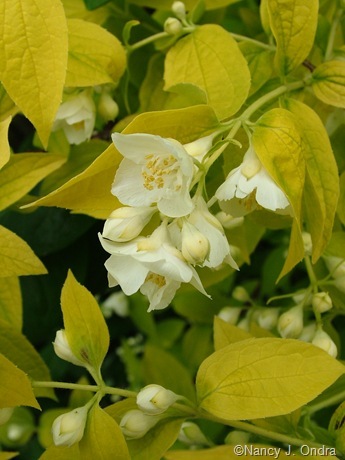 I imagine that a crown made from Philadelphus coronarius (sweet mockorange) would be delightfully fragrant, as would a lei made from Hedychium coronarium (garland lily or ginger lily). Among the herbs, as well as a number of plants you probably wouldn’t think of as herbs, you’ll often find botanical names that include officinalis, officinale, or officinarum, which indicate that the plants have been used medicinally at some point. A few common examples include Rosmarinus officinalis (rosemary), Salvia officinalis (culinary sage), Melissa officinalis (lemon balm), borage (Borago officinalis), and Levisticum officinale (lovage); a couple of less common examples are Saccharum officinarum (sugarcane) and Taraxacum officinale (dandelion). For the specific medicinal use of inducing sleep, there’s somniferus (-a, -um), as in Papaver somniferum (opium poppy). No bonus points for guessing that edulis – as in Passiflora edulis (a passionfruit) and Pinus edulis (pinyon pine) – means that a plant is edible. You may not know that esculentus (-a, -um) means the same thing, but it’s not surprising once you consider a few examples, such as Lycopersicon esculentum (tomatoes), Fagopyrum esculentum (buckwheat), Abelmoschus esculentus (okra), Colocasia esculenta (taro), and Manihot esculenta (cassava). 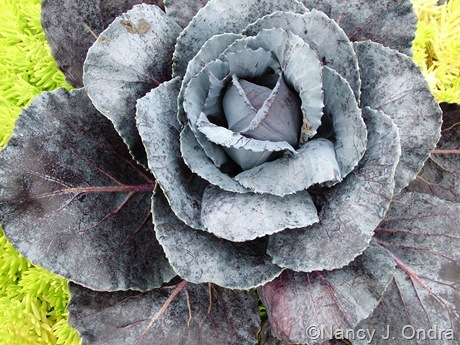 Plants specifically eaten as vegetables (usually as greens) may have oleraceus (-a, -um) in their name, as in Portulaca oleracea (purslane), Acmella oleracea (toothache plant), Spinacea oleracea (spinach), and Brassica oleracea (cabbages and kales). I haven’t found many names that refer specifically to flavors, but there are a few. You’d probably want to avoid eating plants with amarus (-a, -um), acre, or acris in their names, as these words indicate an unpleasantly sharp or bitter taste. 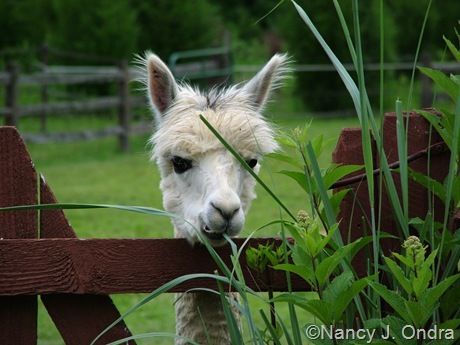 I can tell you that alpacas too avoid grazing on Ranunculus acris (tall buttercups), though they are happy to nibble on Panicum amarum (bitter switch grass). 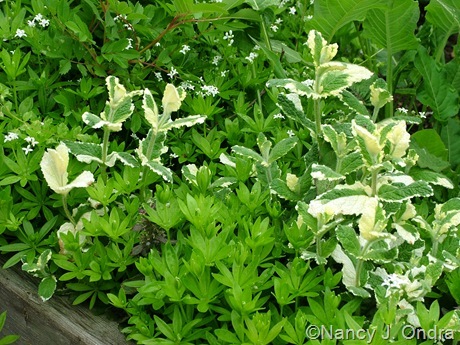 I’ve bitterly regretted ever planting Sedum acre (goldmoss sedum or biting stonecrop), though that’s because of its aggressive spreading and not because of its flavor. In contrast is melliferus (-a, -um), which refers to sweet nectar, as in Salvia mellifera (black sage) – a species prized for the honey made from its flowers. Flavor-related names may not be very abundant, but those related to fragrance (or lack thereof) certainly are. For scent in general, there’s aromaticus (-a, -um) think of Rhus aromatica (fragrant sumac) and Ageratina aromatica (white snakeroot). Odorus (-a, -um) and odoratus (-a, -um) – as in Daphne odora (winter daphne), Galium odoratum (sweet woodruff), and Lathyrus odoratus (sweet pea) – usually indicate a perfumey fragrance, while inodorus (-a, -um) and inodoratus (-a, -um) tell you that the plant may not have any scent, as in Philadelphus inodorus (scentless mockorange). For a sweet scent, look for names that include fragrans or suaveolens: for example, Osmanthus fragrans (sweet olive), Pelargonium fragrans (nutmeg geranium), Brugmansia suaveolens (angel’s trumpet), and Mentha suaveolens (apple mint). If you like a slight scent of musk, look for plants with moschatus (-a, -um) in the name: Rosa moschata (musk rose) or Malva moschata (musk mallow), for example. 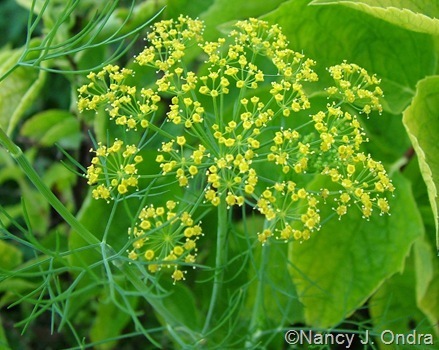 Graveolens indicates a strong scent, as in Anethum graveolens (dill), Apium graveolens (celery), Pelargonium graveolens (rose geranium), and Ruta graveolens (rue). “Fetid,” meaning foul-smelling, isn’t a word you hear too often these days, but it might be a good one to remember when considering a particular plant for your garden, especially for a spot close to a path or patio. It may appear in botanical names as foetidus (-a, -um) or – if the namer thought the plant was really stinky – foetidissimus (-a, -um). 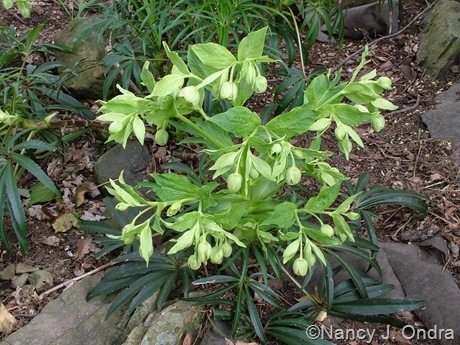 Usually, though, it’s not as bad as it sounds, because the odor is often only an issue when the plant’s leaves or roots are broken or crushed, as is the case with Helleborus foetidus (stinking hellebore), Passiflora foetida (stinking passionflower), Eryngium foetidum (culantro), and Iris foetidissima (Gladwyn iris). It’s a little more unfortunate in a plant that you may be trimming frequently, as with serissa (Serissa foetida). And sometimes it’s the floral scent that can be a little off-putting, as in the case of Trillium foetidissimum (foetid trillium), but even then, who couldn’t ignore a little carrion odor for a few days a year? Another interesting post. I knew most, but have learned now that esculentum means edible rather than anything to do with school (spanish escuela) and acre means acrid. I always wished my school had offered latin, which I know makes me weird. 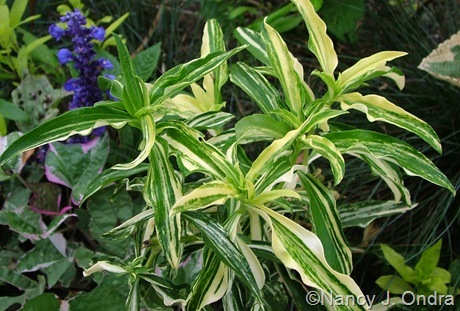 Your variegated soapwort is stunning, it looks like a tropical houseplant. 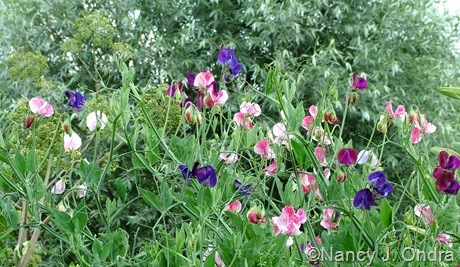 And those sweet peas are blooming in my favorite jewel colors. Perhaps echinops ritro should be renamed echinops foetidus. I ripped out lots this fall because to me it smells like wet dog. Oh, now I’m going to have to try growing Echinops ritro again to smell it again for myself. (Hmmm…maybe that’s why I always think of it as Echinops rut-ro: the Scooby Do thistle.) I’d rename Persicaria polymorpha as Persicaria equina, because to me it smells like a sweaty horse (not necessarily a bad thing). 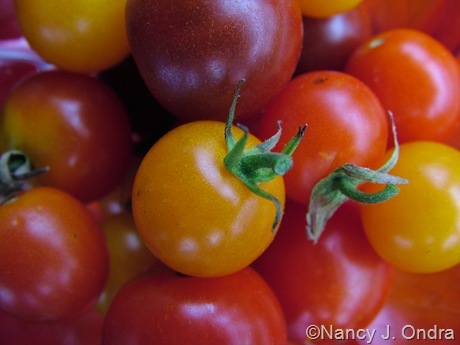 Your pictures paired with these explanations are beautiful ! I would print this post off as a quick “go to” reference that makes quick sense of the Latin/Greek name of the plant .. I love doing these posts, because I learn so much as I’m putting them together. And I’m finding it much easier to remember the names when I learn (or relearn) them in groupings like this. I’m glad you find them interesting too! Another chapter for the book “What’s in a Name”!? It would be a great reference. Thanks Nan. My word for the day -officinalis – didn’t know it referred to plants that may have/had medicinal uses. 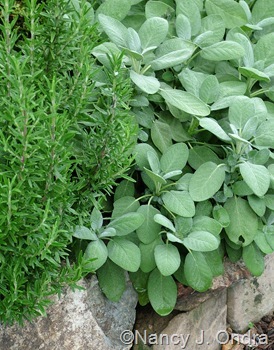 Makes sense, though, doesn’t it, when you think of how common it is among the herbs? I didn’t even realize how many there were until I started trying to come up with examples. Doronicum *is* immensely useful, Carolyn: I know I’ve never been bothered by any leopards in gardens where I’ve seen it growing. It’ll be my go-to plant if the critters ever show up around here! Oh, Diana – trust you to ask. I set myself up for that one, didn’t I? Doronicums have cheerful-looking, vibrant yellow, daisy-form flowers and bloom in spring up here. They really are bright, so maybe that’s what keeps the leopards away? …lovely to see that even you are using and finding the Latin system very useful. As a Swede I have learn a bit about it in school – the man who inveted the Latin system were Swedish; Linné – and then I have tried to learn more as a gardenfan! Absolutely, Susie – three cheers for Carl von Linné, patron saint of plant geeks everywhere! Welcome, Janet! I’m delighted that you found me, and that the post was of interest. Good to have you as a subscriber.